Crimson Skies has long been missing "closure" so-to-speak. When FASA closed it's doors, and the board game went out of production in 2001, there were rumours of unreleased sourcebooks. 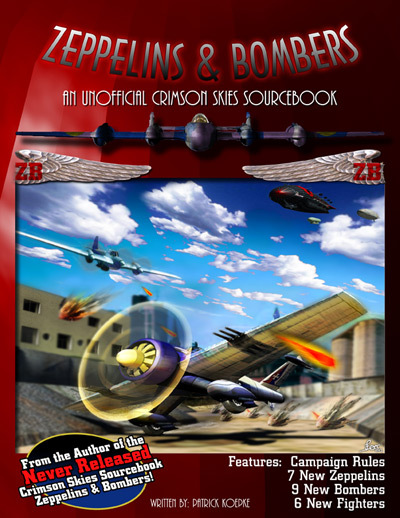 A few scant copies in German, rumors of english printed copies of something titled "Zeppelins and Bombers" a sourcebook to include these two important components of Crimson Skies into the fighter-based combat game. And they were just that, rumours and unfounded. Well here in 2012, the writer of Pride of the Republic, the Crimson Skies sourcebook covering Texas, Mister Patrick Koepke a succesfull writer on his own as well: Announced that he would finish Zeppelins and Bombers as a good will gift to the Crimson Skies community. He was the original developer of the rules and designs, and was stopped only by FASA's closure. Campaign rules for running a long-term campaign of 24 seperate engagements with multiple sides. The ability and resources for fans to construct their own!!!!!! Now of course, the intellectual properties (I believe that's how it's used?) belong to the respective owners, Smith and Tinker, Weisman, Microsoft, whomever owns which little chunk of paradise. However with no current seller of the Board Game, or it's add-on print resources, this will be a welcome gift to the Crimson Skies fans out there. Now, without further ado, the whole set a links for anyone wanting to dive right into it. As fans make or produce bombers and zeppelins,etc.etc. I will upload them to this page. And on a personal note, I myself, as administrator of this website, thank Patrick for ALL of his HUGE amount of hard work he put in this. His willingness to help out fans of the game is truly appreciated. I also want to thank Foxmalcom for his work on the project his artistic talent he has been kind enough to help with, his work is amazing.